Hi! I’m Elinor. Creator, Pastry Chef turned healthy, self-taught cook, wife, succulent lover, Australian, Israeli, with a dash of German too! Quite the cocktail, right? Welcome to my little corner of the net, Let’s Brighten Up. A healthy vegan food blog that’ll brighten up your eating experiences, views on food, and refined sugar free baking! I have found my purpose and created a platform where I can share and show you just how incredibly delicious a vegan meal or sweet treat can be without animal products, processed ingredients, or refined sugars. A Little Background As To How It All Began! After having worked for many years as a pastry chef, baking hundreds of cakes, cookies, pastries, and sweets every day and constantly tasting each variety to ensure they were 100% up to standards, I started questioning what I was eating. As I became aware, I understood that I wanted to change my entire lifestyle, and embrace a healthier one. I stopped tasting all the goodies I baked because I didn’t want to continue filling my body with all the refined sugars, flours, processed ingredients, stabilizers, and pasteurized eggs, that were used to make them. I LOVED my profession, but stopped tasting all the goodies… That was always the best part! Change was starting to happen. I was working long and stressful hours each day, had no social or family life, and desperately wanted to embrace a healthier lifestyle. So, I found the courage to quit my job and figure out if I might need to consider a career change. With nothing on the horizon, I knew for certain that I couldn’t continue down this path. Now, don’t get me wrong, it wasn’t a decision I made lightly at all. I LOVED my job, well the baking part of it, and loved getting my hands, apron, and sometimes ears covered in chocolate and flour. After travelling with my hubby, and having time to think, shortly after I returned I began weighting the idea of starting a blog, since it always sounded like such a dream job. The comfort and ability to work from home, the flexible hours, and being able to spend as much time with our future children as possible. After thinking it through many times, I decided to give it go, yet knew the first thing I needed was a name. I wanted something that would stand out and at the same time have many different meanings. I began brainstorming extensive ideas, and talked them all through with my Father, but none of them stood out. Then suddenly he said LET’S BRIGHTEN UP. Let’s Brighten Up! It automatically stuck and had a positive ring to it, plus also had many meanings. Let’s Brighten Up could relate to your views on food, health, life, sweets, and treats, eating experiences, body and soul. It was love at first sight! So, I chose the name and created the blog. It was a few months later when I accidentally came across a few HORRIFIC videos of the meat and dairy industry, that I was brought to tears, woke up, and the rest is history! Occasionally you’ll find that I post a random fermented or pickled vegetable recipe. 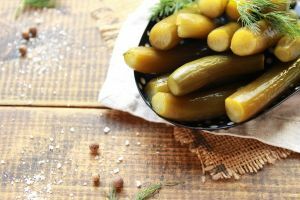 They have many health benefits, are extremely delicious, and I can’t get enough of them, like my homemade dill pickles that I’ll always have a jar of in my fridge. You can read more here. If you’re new here, I’ve handpicked a few of my favorite recipes for you to try out. I’d love to get to know you all, so please feel free to leave a comment or contact me here.